To a student of the British Civil Wars, it soon becomes obvious that the perception one is given of the conflict is of an overwhelmingly land based series of campaigns. While the names of Popham, Rainborowe, Blake, Prince Charles and Prince Rupert appear in a maritime setting, the general feeling is of generals-turned-admirals with English naval vessels in the hands of Parliament in pursuit of other ships of the English navy in the hands of Royalists, leaving the naval power of Scotland and the Irish Confederacy largely unexamined. Since J R Powell’s less than satisfactory The Navy in the English Civil War (London 1962) it cannot be said that any academic study has seriously concentrated on the nature of the civil wars at sea. Blakemore and Murphy’s study sets out to correct some of the assumptions about the war at sea. They commence with an overview of early modern warfare naval when the Dutch were a recognisable naval power and when the light, fast but heavily gunned and easily sailed coastal frigate was new technology. This was also the period when King Charles I’s newly created ‘ship money’ navy, while it had built a solid, modern big vessel deep water fleet, had not built the sort of fleet suitable for the kind of war that it was eventually going to fight. This explains the Dutch victory at the Battle of the Downs in 1639, and what happened between that episode and the Battle of Scheveningen in 1653 when the Commonwealth navy heavily defeated the Dutch is the journey on which this volume takes us. How did this ‘transformation in British naval activity’ (p 7) occur and was the impact of naval warfare in the civil wars as limited as some historians have assumed? 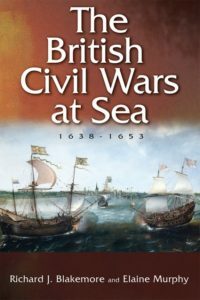 The authors make the valid point that while only a few people in the British isles had direct experience of warfare on land through participation in the continental wars of this period, as a maritime nation, this was certainly not true of warfare at sea. As N A M Rodger states: ‘Robbery under arms was a normal aspect of sea borne trade’ (p 12) during this era. As the wars progressed, many authorities began issuing letters of marque and this shaded easily into outright piracy on all sides of the conflict.. Many merchant vessels carried their own armament as a result. The vessels being utilised in such operations where often the previously mentioned frigate and the English were slow in recognising their value. The previous chapter examined the development of state navies, but with the outbreak of civil war in 1638, what constituted a state was to be tested to breaking point. Rebellions on both Ireland and Scotland were followed by that in England and the King soon became aware that he had lost his much vaunted new navy to Parliament as London and the major naval hub of Chatham chose sides. Seaman and watermen were forward in the protests leading up to the outbreak of war. As conflict expanded and towns became cut off by siege, resupply by sea became an important aspect of how things developed with places as far apart as Drogheda and Lyme benefitting from seaborn relief. It became clear from an early stage that while naval operations were likely to be important to the conduct of the war, major set piece naval battles were unlikely to be a large part of the conflict. The third chapter examines the war at sea between 1642 and 1646 and a large part of parliamentarian naval operations was to ensure that important coastal installations did not fall into royalist hands and to this end, frigates and other light vessels became an important aspect of naval activities. The sieges of Hull and Plymouth, for example, failed due to Parliamentarian naval supremacy and Parliament was certainly in the ascendant at sea by 1645 while Royalist naval operations were in free fall. In the following chapter, the authors remind us that Parliament relied on the major naval base of Chatham and ships in the Thames/Medway confluence to protect the city of London which was key to the conflict. There is an intriguing discussion on the supply of vessels and one which serves to remind us just how far things were able to keep going even in the midst of a civil war. The administration of such organisations as Trinity House never appears to have broken down and this is clearly worthy of further study. The finances this required begins to make the King’s ship money look small by comparison! The use of the press to gain men for the fleet must also have been less that popular among seafaring men although the encouragement of privateering may well have been more so. Chapter five examines Royalist, Irish Confederate and Scottish naval efforts and this is certainly an interesting and under researched area. Apparently, archival survival in these areas is not all it might be, unsurprising in the midst of a civil war. The Royalist fleet, although at times seemingly substantial, is something of an illusion as ships came and went and merchant vessels were pressed into service as substitute capital vessels and many of the King’s ‘captains’ the Antonio Vanderkipps and Theodore Dommers, were dubious figures at best. The Confederate fleet appears to have been a scratch affair (no state navy here of course) although it did contain useful frigates and other light vessels. Although the actual size of the fleet is largely impossible to quantify due to lack of archival evidence, the success rate was high with some 468 prizes being taken although the tendency of privateers to go where the best prices were meant that the Confederacy often gained little from their activities. Scottish naval activity seems often to have been an excuse for an extension of clan warfare by sea with the redoubtable Alasdair MacColla raiding the Campbell family enemies before joining Montrose. The numbers of Scottish privateers seems to have been small and to have achieve little success. The final outcome was for most Confederate and Scottish vessels to find their way into the hands of Parliament as the outcome of what we generally know as the Second Civil War. Naval discipline broke down in 1648 with the mutiny in the Downs and the sailors’ refusal to accept Rainborowe as their admiral. Prince Rupert’s navel mischief-making came in the end to naught but might-have-beens and the Parliament navy then becomes a tool of conquest as Cromwell’s forces moved north and west. Converted soldiers, the ‘generals at sea’, Blake and Popham, proved to be equally effective as admirals. And by 1652 the Royalist cause at sea, as on land, was equally lost. This is an entertaining, readable and highly useful study containing fine line illustrations from artists such as Van der Velde, tables and a map not to mention and index of ships (all of these so often lacking in such studies) and leads one to wish for further research in this area in, for example, shipboard tactics, building and maintenance of vessels and so much else. One can only hope that this study will encourage further research upon the naval aspect of the Wars of the Three Kingdoms.